So, you are leaving the country of your birth, to take up residence about as far away as you can get…what do you take with you as a ‘souvenir’? Not counting your Canadian passport, which, as we said weeks ago, we are not giving up. Nothing says Canada like great Aboriginal art. Alex Janvier, of Dene Suline and Saulteaux descent, is one of our favourites and one of Canada's best. We are very proud to own these two pieces. We have a lot of things that are uniquely Canadian. We have, for example, 2 paintings by Alex Janvier. Though his work falls on the abstract side of things, it is Canadian Aboriginal art, and will always say ‘Alberta’ to us. We had some deer antlers in our garden that Dan’s dad found on his property – those would have been great reminders of home – but we’re pretty sure if we tried to take them, the Australian customs people would have just torched the entire sea can and we’d have to replace our furniture. The antlers are now safe in a friend’s garden. This is the guy responsible for ruining Lisa's desire for Canadian souvenir clothing... Next, he may just ruin our country. Award from UofA and spend it on a piece of art. That was a great idea, but rationally, should she really spend $3000 on art right now? Maybe not. But even something as simple as a hoodie from Roots seemed impossible to find. Is it too much to ask for some good ‘Canada’ clothing? 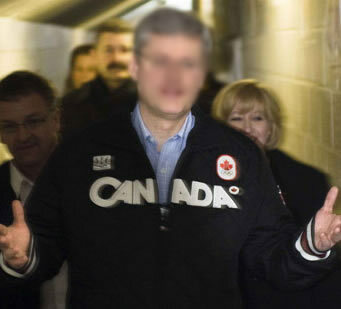 Even Stephen Harper wore a Roots Canada jacket during the election! Oh, wait… maybe this isn’t the best souvenir ever. Damn you, Stephen Harper! In the end, Lisa bought a couple of small items. One was a water colour by Fanny Fynebuik, who is the mother of a close friend. It is called “En Route to Jasper”, a pastoral mountain scene filled with trees and crystal blue water… and very different from any other art we have. At the same time, she bought a similar piece for her former doctoral supervisor as a retirement gift, so for a lot of reasons there is sentimental value to this. While in Owen Sound, Lisa also bought a few books…one was a photo book of the Grey-Bruce area, and two were mystery novels by local writer Richard Thomas, part of a series set in the city. And her family gave her a professional photo of Inglis Falls, one of the great landmarks of the region. While Lisa wasn’t sure about what to choose as a memento – photos, paintings, books, clothes – Dan was sure that he wanted to commission a piece of original art. There was a bit of thought about exactly what, and a lot of pondering about who to do it. It all came together in Owen Sound though. In Edmonton, there were too many choices; Owen Sound had only one: Tattoos by Zap. Shortly after arriving in town (and just before that great trip to Yummy, Yummy!) Dan had a 2 minute chat with Alex, Zap’s main artist. Dan told him very vaguely what he wanted (an inukshuk with a Canadian flag on one of the rocks), handed over a $40 deposit, and set an appointment for later in the week. Alex sketched some circles on a piece of paper, nodded his head, smiled and kept saying how cool it all was. He was very pleased that we didn’t arrive with some pre-planned image pulled from the web. We wanted to leave it to the expert! The stencil version that Alex worked from. OK, so it isn't HUGE, but bigger than Dan had thougth he would get. Choosing a tattoo artist, especially for the first one, is a very big decision. When we showed up for the big event (what Dan’s sister referred to in an encouraging message that morning as Ink Day), we knew he had made the right decision. The sketch that Alex had done was exactly what we had envisioned, but better. It was also huge! Dan’s vision was a small, sedate little tattoo; maybe just an inch or two tall. But Alex had other ideas… and we’re glad he did! Dan’s appointment was the first of the day but they were running a bit behind, so we had to wait maybe 20 minutes for them to set up. During this time, a young woman came in to discuss some tattoos that someone else had started, but she wasn’t liking how they were being done. She was shopping around for someone to fix them. Alex talked to her, asked her a few questions (who did that? how old are you? you want me to fix that? ), gave her a price and asked if she wanted to schedule a time. She said no, she was still shopping around. After she left, Alex was flabbergasted. He talked about how he hated situations like that – an 18 year old woman, making a decision as serious as getting a huge tattoo on her back, and basing it all on price. And, sadly, her tattoo was a mess! It was obvious that he took this seriously; he was an artist, in it for the creativity, not just the money. The artist in action. Dan isn't wincing too much! And as we chatted (while he inked the inukshuk into Dan’s skin), our first impression of Alex was reinforced. He would do something, sit back and ponder it, do a bit more, look, smile, think, ink, smile more… He obviously enjoys making art, and this happens to be a medium where he can make a decent living doing it. And after about 90 minutes of chatting about Australia, art, life, Alex’s upcoming wedding, etc. (it was something like getting a hair cut with a bit of additional pain and loud punk rock music), Dan came away with the ultimate Canadian souvenir. And, Lisa came away with some great photos! About a week after the inking, it was all healed and looking beautiful! Maye if Dan loses his passport some time when coming home to Canada, he can just pull up his sleeve. This tattoo is as good as a Nexus pass! Pain factor: not bad. Dan is a bit of an idiot, and too often reaches into the oven to grab something but forgets to put on an oven mitt…ends up with a big red welt on his hand. He compared the tattoo process to this, but with no residual pain: unlike a burn, the tattoo pain stopped as soon as the needle did. A couple of days later, with the healing process going very well, Dan commented that if he had known it would have been so easy, he probably would have gotten a tattoo years ago. But then again, it wouldn’t have made as much sense. This one is special. Lots of people just get some tribal thing, a skull, some flowers, whatever…nothing wrong with that…but this one has deep meaning. It wasn’t just a tattoo, it was an event, a marking of a major event in life (and seemed to make more sense than another client at Zap who chose a brass knuckle tattoo to commemorate her first child (!) and was now looking for something to mark the birth of kid number two). It might lead to more, and it might inspire Lisa to get one in Wagga – Dan gets the going tattoo, Lisa gets the arriving tattoo? Stay tuned to see what it is… and feel free to comment here with suggestions. This entry was posted in art, Canada, Moving, Owen Sound, small town culture. Bookmark the permalink. Gorgeous! Excellent shading in it too. Thanks for the rec on the artist…been seeking out suggestions for the next one. I like his process (and it doesn’t sound like a need to wait a year for an appointment like another artist who’s work I admire). It might be worth the drive…under 3 hrs for you and maybe a part of the province you haven’t been to. And I don’t have any experience with tattoos but I think this was a good place to get it done. Great to see you both serendipitously in Yokosuna – glad i caught you both before you went. Love the blog and will keep up with all the news….Have a ball in the UK. Yes that was a stroke of luck. So glad we got to see you! Hope your trip down under is a good one…too bad we’ll just be missing one another there. But our paths will cross again.